Still reading! A friend and I had a conversation about books recently and realized that we have similar tastes. She passed this one on to me and recommended a few others. Some of you have recommended books as well. It's exciting to have so many books to look forward to reading! There's nothing like a good book! 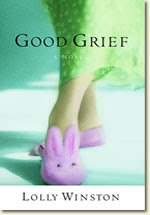 I started reading Good Grief yesterday. I only got through a little more than a chapter because I tried to read while at the pool with the kids. Even with The Husband there it was diffficult to get more than a few uninterrupted minutes! I think I read every paragraph three times because I had to stop and start so many times! Ah well, such is the life! Anyway, so far so good! how are you? sorry i haven't been blogging lately and i think a recent comment i left on your site didn't go through. anyways, i'm curious if you like this book. i read her second book "happiness sold separately" and while i liked the easy flow of her book, i hated the message. let me know if this one has a better point. it's been fun to read about your current reads. i love hearing about books. i also love your gratitude messages. your blog continues to impress and inspire! i'll let you know what i think of the book! thanks for the nice words, too! hope you're having a great summer!